Violet is a shy teenager who dreams of escaping her small town and pursuing her passion to sing. With the help of an unlikely mentor, she enters a local singing competition that will test her integrity, talent and ambition. Driven by a pop-fueled soundtrack, Teen Spirit is a visceral and stylish spin on the Cinderella story. KIDS FIRST! Film Critic Nathalia J. comments, “Can I say catchy! 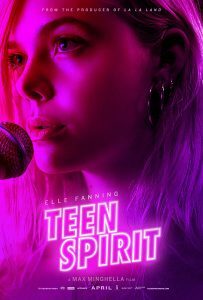 Teen Spirit, directed and written by Max Minghella, is ever-lasting, vivid, enthralling, remarkable and a momentous film. It is loaded with important messages that can be applicable during life. Let me warn you, it’s an entertaining ride. Get ready to sit back and enjoy some beautiful music.” Zoe C. adds, “This is a different musical: Teen Spirit is not about the typical dream of becoming a star, but the situations and temptations you face throughout the journey. It is fueled with great acting and a powerful soundtrack. It’s definitively a nontraditional coming of age story.” Ivey H. wraps it up with, “The scenes are great to watch. I enjoyed the color scheme, lights, music and costumes which support the entire vibe of the movie. This film reminds me of other iconic movies such as Flash Dance and Footloose. TheTeen Spirit helps you understand how the music /entertainment industry is full of “smoke and mirrors.” The message is to keep people around you that you trust and that have your best interests at heart.” See their full reviews below. The story follows a shy, stylish, and deep feeling youth named Violet (Elle Fanning). Wow! What a dream she has of pursuing her passion to sing and break free from her small town. With the help of an unexpected mentor, she enters a local British TV talent show that will test her patience and ambition. This film allows you to experience one of the most beautiful and emotional touching stories ever. The lead characters are Elle Fanning (Violet), Millie Brady (Anastasia), Elizabeth Berrington (Lorene), Jordan Stephens and Rita Zmitrowicz (Hayley). My favorite part is undeniably when Violet executes a breathtaking performance during the finals. I enjoyed this moment because it really inspired me to take big leaps of faith just like Violet did. I also enjoyed this moment because it shows how far Violet has come to achieve her dream. My favorite character is the inspiring and hard-working Violet, not only because she is the lead character, but because she inspires us to believe in yourself and don’t let anyone tell you that you can’t accomplish a dream, big or little. An important aspect of the movie is the creative and story-telling music. I enjoyed numerous performances throughout the film because the songs aren’t just up-beat catchy tunes, they also tell a powerful and moving story which explains Violet’s past. This film promotes many positive, heart-warming, uplifting and inspiring messages such as being true to yourself. For example, Violet has a dream that she wants to achieve, but she doesn’t change for anybody to accomplish that dream. She works hard to accomplish it though. Another important message is about how peer pressure influences you, but you most follow your heart and be strong. I give this film 5 out of 5 stars and recommend it for ages 10 to 18, adults can enjoy as well. You can catch this film at your local movie theater on April 19, 2019. So look for it. This is a different musical: Teen Spirit is not about the typical dream of becoming a star, but the situations and temptations you face throughout the journey. It is fueled with great acting and a powerful soundtrack. It’s definitively a nontraditional coming of age story. Violet (Elle Fanning) loves singing, but, more than becoming a star, she wants something different in her life. She wants to escape from her small town and auditions for a popular singing competition in the U.K. called Teen Spirit. A stranger she meets in a small bar, Vlad, becomes her mentor; although her mother doesn’t like the idea at first, later she approves. With her mom’s blessing, Violet embarks on a journey in which she will face obstacles and make important decisions. This is a good film for teenagers; the classic Cinderella story is retold in a modern world with current events and situations. Although I am slightly disappointed with the ending, the story flows slowly but nicely, and the music is enjoyable. The ending should tietie the movie all together, but this one seems to be missing something. There are a couple of parts that I don’t feel are complete or well-developed and the storyline was kind of plain. Elle Fanning is great in her role. 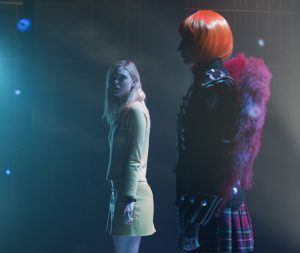 Teens can connect to her character, Violet; Elle actually sings most of the songs, making this connection even stronger. It is very remarkable her ability to perform a “triple threat” meaning she can act, dance and sing. She also speaks a foreign language fluently (her character is of Polish descendent, and Violet exchanges some lines in this language with her mother). The relationship between Violet and mentor, Vlad, ( Zlatco Buric) is key in the film. It is unconventional but somehow predictable. This film is produced by a La La Land producer, and has elements in common but with a European flavor. I love the wardrobe and the makeup is good as well. I love all the songs and the montage in the main audition scene. I enjoyed this dramatic, vibrant, pop culture movie! Teen Spirit is written and directed by Max Minghella, a filmmaker from Hampstead, London, England. The music, costumes and storyline are very intriguing. I really like the way the director shot the scenes. The film is about a teenage girl, Violet, who has a complicated life. She has a single mom, and they are on the verge of losing everything. They both work multiple jobs just to survive. Violet has many interests and is more of an introvert, although her passion is singing and dancing. She enters a local talent contest with the help of a friend she meets in a nightclub. This friend has an interesting past. By entering the contest, Violet brings hope to her small town. The movie has some unexpected twists and turns. Violet is played by Mary Elle Fanning. Her performance is amazing. She is a natural beauty, and I love her style in this film. This is a difficult and complex character to play. Violet is an introvert and a sort of sad young lady. You really feel for her and Maria, her mom, in their everyday struggles with life and school. On a brighter note, the music and lyrics are so well done. I am really impressed with her ability to sing. Her voice is mesmerizing — it gave me goose bumps! Agnieszka Grochawska plays Violet’s mother Maria. They are both of Polish decent. Agnieszka is very intense in this role and also made me laugh in a few parts. The bar friend and manager, Viad, is played by Zlatko Buric. He plays a very important supporting role. I like the backstory with this character as it is unexpected. His character and relationship with Violet really pulls the plot together. The scenes are great to watch. I enjoyed the color scheme, lights, music and costumes which support the entire vibe of the movie. This film reminds me of other iconic movies such as Flash Dance and Footloose. TheTeen Spirit helps you understand how the music /entertainment industry is full of “smoke and mirrors.” The message is to keep people around you that you trust and that have your best interests at heart. I give this film 4 out 5 stars. It is for an audience range of 12 to18. Adults will definitely enjoy this movie, too. I do not recall any bad language so I give it thumbs up for that. There are a few scenes with drinking, smoking and slightly risky behavior. It opens in select theaters everywhere April 19, 2019. Breakthrough is based on the inspirational true story of one mother’s unfaltering love in the face of impossible odds. When Joyce Smith’s adopted son John falls through an icy Missouri lake, all hope seems lost. But as John lies lifeless, Joyce refuses to give up. Her steadfast belief inspires those around her to continue to pray for John’s recovery, even in the face of every case history and scientific prediction. From producer DeVon Franklin (Miracles from Heaven) and adapted for the screen by Grant Nieporte (Seven Pounds) from Joyce Smith’s own book, BREAKTHROUGH is an enthralling reminder that faith and love can create a mountain of hope, and sometimes even a miracle. KIDS FIRST! Film Critic Calista B. comments, “Despite not being religious and usually not enjoying movies like these, I like this movie. Every once in a while, everyone needs an emotional yet inspirational story and this is it.” Siaki S. adds, “Breakthrough is a phenomenal, inspiring film. I was intrigued by this film because of the powerful message it shares.” Zoe C. wraps it up with, “This is a very heartfelt movie that will make you cry and laugh at the same time. Based on a true story with a strong religious theme, Breakthrough is a perfect movie to enjoy with your family. It doesn’t matter what your religion is: it is very easy to connect with this story and to feel very emotional. I love the acting and all the positive messages it contains.” See their full reviews and interviews with cast and crew below. Despite not being religious and usually not enjoying movies like these, I like this movie. Every once in a while, everyone needs an emotional yet inspirational story and this is it. This movie is based on the true story of Joyce Smith and her son, John, after he falls through a frozen lake and ends up dead for about an hour. Yet, when his mother prays for him to be revived, he suddenly gains a pulse. The rest of the movie is about Joyce hoping for John to fully recover. It is important to mention how this is a movie about faith in God and the love of a mother. I am not religious, so I must bring up the question: “Do you need to be religious to enjoy this movie?” I feel that you can enjoy this movie, even if you don’t believe in Christianity. The religious aspect is very prominent, however it’s not as forced as I originally predicted it would be. Plus, having strong faith in God actually makes sense in the context of this movie. Chrissy Metz (Joyce Smith) stars in Twentieth Century Fox’s BREAKTHROUGH. Photo Credit: Allen Fraser. In a movie like this, arguably the most important aspect is the acting. While the whole cast is pretty great, the main star, hands down, is Chrissy Metz as Joyce. Most of the emotion comes from her stellar acting. The scene where she prays over John’s body really hit me hard. Of course I can’t gloss over everyone else in this amazing cast. A particular favorite is Topher Grace as Pastor Jason Noble. He really helps lighten the mood when the movie needs some relief. This movie is based on a true story and, since John Smith is still alive, one can guess how this film ends. Despite that, many moments in this movie are genuinely suspenseful. When John falls through the ice, it actually startled me, despite the fact that I knew what was about to happen. The actual climax is filmed in a very interesting way which is filled with tension. My one problem with the film is that it feels as if the dad doesn’t have much to do. He is present in his son’s life and he cares about him, yet it feels like the movie mostly forgets he exists. This movie definitely is more focused on the mom, yet that felt weird to me. I give this movie 3 out of 5 stars and recommend for ages 10 to 18. It comes in theaters nationwide on April 17, 2019 so look for it. Breakthrough is a phenomenal, inspiring film. I was intrigued by this film because of the powerful message it shares. The film was inspired by a true story that hit the nation with unwavering faith, hope and prayer. John Smith, who the film is about, is played by Marcel Ruiz who grew up in the film industry and both parents are award-winning directors. John Smith, a courageous teen, is Latino who struggled with his identity and learned that love conquers all. 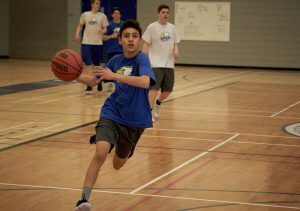 John Smith is passionate about basketball and hopes to one day become a professional basketball player. His passion helped him endure this incident to the very end. Due to excruciating events that occur in this film, I realized and appreciate the miracles that I am able to witness and enjoy within my own life. The film is directed by Roxanne Dawson, a theater arts major from University of California Berkeley who is also known as an actress (Baywatch, Star Trek). Breakthrough was written by Grant Nieporte a screen writer (Seven Pounds). What I like most about this film is the friendship of family and friends who become family in a tight knit community. They join forces and focus on one major life threatening situation. This film portrays unity, love and compassion. Another thing that I really enjoyed is when one rescuer, who didn’t believe in God, learned that there actually is a God and, from that moment on, it changes his life in many ways. The rescuer later received other signs that led him to believe in God. John Smith’s mother is played by Chrissy Metz (This Is Us, Sierra Burgess Is a Loser) who portrays her in the most believable way. She delivers a powerful message about faith and perseverance. Chrissy builds a relationship with Pastor Jason-Noble (Topher Grace, That ‘70s Show). 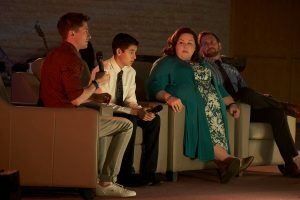 In Breakthrough, Pastor Jason-Noble is intricately involved in helping Chrissy deal with the situation and is an inspiration and light to many. I give this film a 5 out of 5 stars and recommend it for ages 12 to 18 and as well as adults. Breakthrough comes out in theaters April 17, 2019 so make sure to look out for this inspirational, educational and motivational film at a theater near you. This is a very heartfelt movie that will make you cry and laugh at the same time. Based on a true story with a strong religious theme, Breakthrough is a perfect movie to enjoy with your family. It doesn’t matter what your religion is: it is very easy to connect with this story and to feel very emotional. I love the acting and all the positive messages it contains. This is the story of a 14-year-old boy, John Smith (Marcel Ruiz) who suffers a terrible accident: when playing in a frozen lake, he drowns and is rescued by a fireman about 20 minutes later. He miraculously survives but is in serious condition. His mom never surrenders hope and prays with fervor to keep him alive. I like the underwater scenes: I love how they look and how they are filmed. 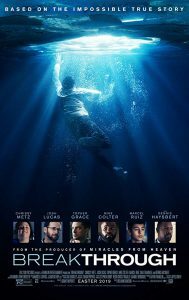 In the movie poster we see the main character under the water, and, despite knowing he will fall, I still jumped from my seat when the ice broke. I think it is amazing how a simple story can make such an impact on the audience. The story is well narrated. There’s a song at the beginning of the film that could have been shorter, although it is good. It feels like a music video trapped in a film that is not a musical, but when the movie resumes, the narrative keeps you interested. 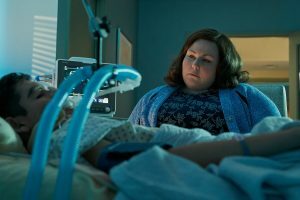 Chrissy Metz, who plays John’s mother, portrays the character so well, it made me cry; you feel the connection with her suffering, and it is very powerful. She confronts doctors, and, although John is in a medically-induced coma, she keeps her faith alive. She doesn’t get along with Pastora Jason Noble (Topher Grace) because she thinks he is too cool to be spiritual, but she bonds with this man who is very supportive and caring. John, of course, spends a good portion of the movie dormant, but he makes you pray for him because you want to see him alive. The message of this film is never give up and always have faith. Another message is even if you don’t fully like someone it doesn’t mean you can’t set aside your differences and work together. I also think is important for young audiences to understand that accidents happen, and we need to be careful. Mr. Link recruits explorer Sir Lionel Frost to help find his long-lost relatives in the fabled valley of Shangri-La. Along with adventurer Adelina Fortnight, this trio of explorers travel the world to help their new friend. KIDS FIRST! Film Critic, Benjamin P. comments, “I love the animation in this film. 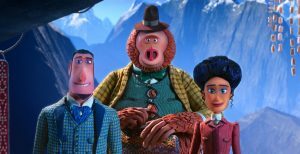 With Missing Link, animation studio Laika continues to prove that its animation is getting better and better with each film. Every locale in this film, from India to the Himalayas is colorful and vibrant. These environments and characters are well-crafted and thought out.” Jordan M. adds, “The movie has outstanding animation and a unique storyline. Because it’s a LAIKA studio film, the characters are made out of clay and there are a lot of incredible details that add to the movie. Fans of LAIKA films will enjoy the artistic style of the film.” See their full reviews below. 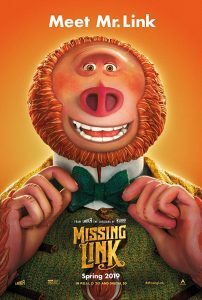 Missing Link is a positively charming adventure with a lovable protagonist and fantastic animation. The story line follows Sir Lionel Frost (Hugh Jackman), a daring adventurer with a flair for the dramatic, who stumbles upon a massive discovery. He receives a letter confirming the existence of the Sasquatch and treks off to meets the sender, a Sasquatch named Mr. Link (Zach Galifianakis). Mr. Link convinces Frost to help him track down his cousins, the yetis, living up in the Himalayas. Together with Frost’s old flame Adalina, they travel the globe in search of Link’s distant family. My favorite character in this film is Mr. Link. He is a big creature with an even bigger heart. Link yearns for family after years of loneliness in the wilderness. Link takes everything very literally which provides the film with some witty gags. Zach Galifianakis’s voice work on this film adds an extra layer to this character with his warm, upbeat energy and comedic voice performance. I really like the character of Sir Lionel Frost also. He is a flawed explorer who has lost his passion for adventure and has gained a desire for success in all the wrong places. It’s interesting to see an adventurer who, although good at what he does, isn’t as dashing and is more unlikable at the onset of this film than the norm. Frost isn’t readymade for the role of hero and earns it as we watch him become a more selfless, kind person during his arc in the film. Missing Link doesn’t overuse the fish-out-of-water trope with the character of Mr. Link. The one flaw with this film is the use of an assassin character named Stenk. This character doesn’t add much to the film, other than an action scene every once in a while and comes across as underdeveloped. It tells the story of monster hunter Sir Lionel Frost (Hugh Jackman) who is in search of a mysterious creature – the Missing Link. He wants to join an exclusive club and needs this discovery to become a part of it. Soon he goes searching and spots the Missing Link in the woods. Link, who goes by Susan, is played by the hilarious Zack Galifainakis. The two set out on a journey to find Link’s home, a land of yetis, so he can finally be part of a family. They are joined by Adelina Fortnight (Zoe Saldana). She is a spunky and fearless woman who helps them on the way. On their way, they encounter villains who are determined to stop Sir Lionel from proving Link’s existence. The movie has outstanding animation and a unique storyline. Because it’s a LAIKA studio film, the characters are made out of clay and there are a lot of incredible details that add to the movie. Fans of LAIKA films will enjoy the artistic style of the film. My favorite character is Link (aka Susan) who is funny and lovable. The movie takes the audience on a journey as Link tries to find out who he is and where he belongs. I also enjoyed the character Adelina because she is the motherly figure of the group. Together, Sir Lionel, Link and Adelina are a perfect team. My favorite part of the movie is when the three characters set out on an adventure to find Link’s family. It is the first time they work together and they are hopeful. The film is a story about belonging and friendship. Sir Lionel and Link form a strong bond. They remind me of Sherlock Holmes and Watson. The movie is full of humor and surprises. I rate this film 5 out of 5 stars and recommend it for ages 2 to 18, as well as adults. It’s fun for the whole family. You can find it in theaters on April 12, 2019. Shazam! is absolutely amazing. It’s entertaining, funny, action packed and engaging. This is maybe the best DC Extended Universe movie so far. 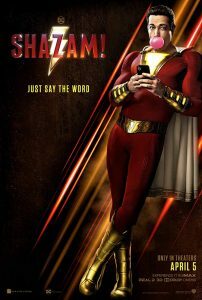 14-year old Billy Batson discovers, with the help of an ancient wizard, that he can turn into a Superhero just by saying the word: “Shazam!” But Billy is not just dressed in a superhero outfit, he also looks older and big! 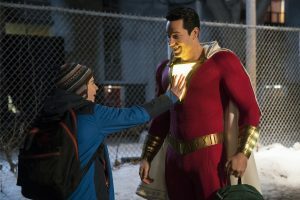 Converted into Shazam, Billy, who lives with adopted parents, goes home and tells his friend (or brother?) Freddy that he is Billy. Freddy loves super heroes and knows everything about them. 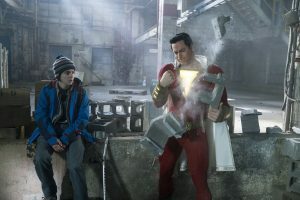 Together they test Shazam’s capabilities and surprise: he is indeed a real superhero. 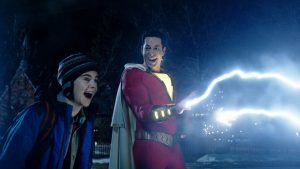 As Shazam, Billy uses his super powers for good but also for fun. 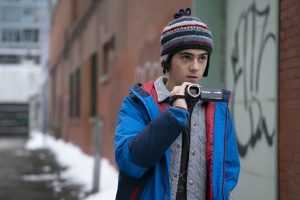 The director David F. Sandberg surprised audiences as he is most known for his horror films, but this one turned out to be an incredible and enthusiastic production. The story works perfectly for the whole family, so I recommend it for ages 5 to18. I am a huge fan of this film: it made me laugh and kept me entertained the entire time, and the visual effects are very good. I give Shazam! five out of five stars. The message of the film is that we can all be heroes: it only takes a pure heart to have the power and strength to do good deeds, help people and beat the bad guys. Shazam! opens in theaters on April 5, 2019 so make sure to say the word and catch it in your favorite theater! The story line follows Billy Batson, a 14-year-old foster kid, who moves in with a new family. Billy gains powers from a wizard who chooses him to be his champion against the forces of evil. 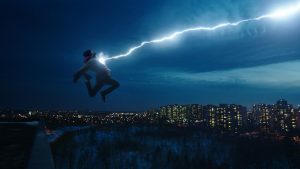 He can transform into a powerful superhero just by saying the word “shazam.” He and his foster brother Freddy test Billy’s abilities to figure out the extent of his powers. Billy navigates the ups and downs of being a sudden superhero, while also clashing with Dr. Sivana, who is determined to take Batson’s powers to rule the world. I really like the performances in this film. Jack Dylan Grazer is good as Freddy. Grazer takes a comedic best friend and makes him much more than a one-note sidekick. 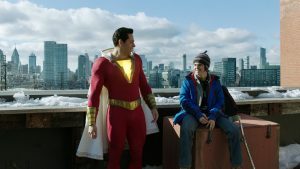 Zachary Levi is great as the super-powered version of Billy Batson. Levi channels the personality of a teenager very believably. His performance is natural and I don’t feel like I’m watching an adult try to play a teen. 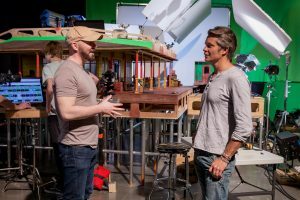 Mark Strong hams it up as Dr. Sivana, but he’s still quite frightening and a real threat to the characters. I love the tone of this film. It’s never self-serious and, rather than making the hero dark and brooding, Shazam! captures its heroes and their powers with a childlike wonder. This film understands that superheroes are people who we can look up to because, even though they are flawed, they always aspire to do the right thing. I love the stakes of this film. It does not rely on apocalyptic proportions to make you care about its characters. The true story of the unlikely relationship between Ann Atwater, an outspoken civil rights activist, and C.P. Ellis, a local Ku Klux Klan leader. During the racially charged summer of 1971, Atwater and Ellis come together to co-chair a community summit on the desegregation of schools in Durham, N.C. The ensuing debate and battle soon lead to surprising revelations that change both of their lives forever. KIDS FIRST! 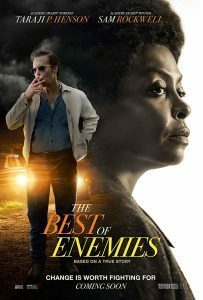 Film Critic Arjun N. comments, “The Best of Enemies has some truly captivating messages and storytelling, but its presentation of the segregation debate can get lost with the lack of background insight. Still, the excellent performances here carry over some of the weaker writing.” Katherine S. adds, “I really enjoyed The Best of Enemies. The movie shows a lot of anger and humor between two enemies who oddly share very common goals in life – family, faith and education.” See their full reviews below. The Best of Enemies has some truly captivating messages and storytelling, but its presentation of the segregation debate can get lost with the lack of background insight. Still, the excellent performances here carry over some of the weaker writing. Anyone interested in docu-dramas might want to check this out. 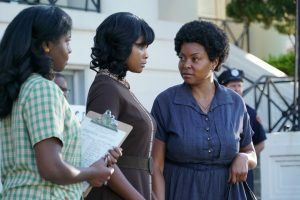 The film centers on the most unlikely relationship between Ann Atwater (Taraji P. Henson), an outspoken civil rights activist, and C.P. 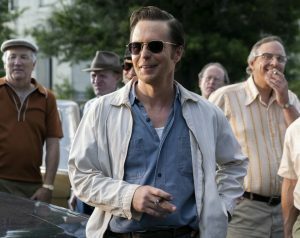 Ellis (Sam Rockwell), a local Ku Klux Klan leader. The two reluctantly battle over the desegregation of schools in Durham, NC during the one of the nation’s racially-charged turning points. C.P. slowly feels drawn towards Atwater’s commitment to her people and becomes a frenemy. Can love trump hate? First, Taraji P. Henson, is fantastic as Ann Atwater with her acerbic nature, but heartfelt fight for the poor and oppressed. She respectfully handles the rebellious, yet kind-hearted nature of the real-life figure. But, the drama’s center comes from Sam Rockwell, as C.P. Ellis, who is my favorite character despite playing an initially despicable figure. His redemption is naturally done, and the messages never feel forced here. The two really work well off each other, and their chemistry is hilarious to watch. Babou Ceesay, as Bill Riddick, gives another great performance with his contributions to the segregation debate being another interesting learning experience. Robin Bussell spectacularly writes and directs with the events presented in a clear, chronological order. But the pacing can be lost amongst this, as the film really stalls when juggling multiple real-life figures. It’s the individual moments that stick, because she knows how to write human and relatable characters. The racial tension feels real here, as did the moments of unity. My favorite scene is the final verdict as the scene is filmed so well, leaving the audience unnerved at each person’s decision. Still, it’s C. P.’s monologue that sells the scene, which I just can’t spoil. Seeing is believing. However, in addition to many moments of rocky pacing, the movie’s focus on other characters, especially Atwater, is quite minimal and scattershot at times. C. P.’s development is forefront and that’s understandable given he is the most complex character. I would have loved to see more personal looks at other characters. The message of this film is that love is the greatest asset in any debate. We can all learn to reconcile our difference and just love each other. I give this film 4 out of 5 stars and recommend it for ages 10 to 18 due to mature themes and racist language. The movie releases in theaters April 5, 2019, so check it out. I really enjoyed The Best of Enemies. The movie shows a lot of anger and humor between two enemies who oddly share very common goals in life – family, faith and education. 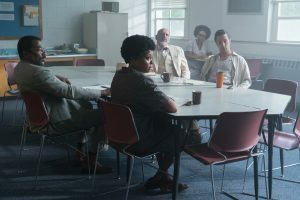 The movie is based on a true story and shows the audience what life might have been like in the 1970s in North Carolina. Ann Atwater is a poor, black single mother living in Durham, N.C. in 1971. C.P. Ellis is the president of the Ku Klux Klan (KKK). When the black children’s school is damaged by fire, Ann wants the black children to attend the same school as the white children and learns that the black children are not getting as good of an education. Ann and C.P. then spend their time convincing others to be on their own side. The acting is terrific. Taraji P. Henson plays Ann Atwater and shows a variety of outstanding emotions from her voice, to her walk. C.P. 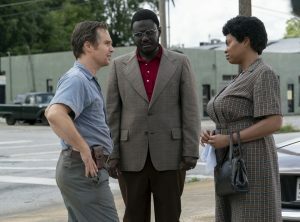 Ellis is played by Sam Rockwell and his acting is incredible also. I wanted to hate him, but still liked him because he is such a good father, especially to his special-needs son. Ann Atwater is my favorite character because she adds a lot of humorous comments right after saying something really serious. My favorite part of the movie is the ending – but no spoilers here! The key message of The Best of Enemies is that change is worth fighting for. If you see something that you think is wrong change it, even if it’s going to be really hard. The movie has mild profanity, some violence and deals with a very serious topic – the inequality of segregation. I give the movie a 4 out of 5 stars. It is appropriately rated PG-13 and I recommend it for ages 12 to 18, as well as adults. This movie opens in theaters April 5, 2019. You are currently browsing the archives for the Feature Film Reviews category.